The Amtrak Marketing department photo library contains thousands of slides that we are working to sort, digitize and make available to the public. The collection includes images of trains traveling through diverse landscapes, Amtrak employees performing their job duties and station interiors and exteriors. With the passage of time, they have become valuable visual records of stations and communities that hold interest for railroad and local historians. 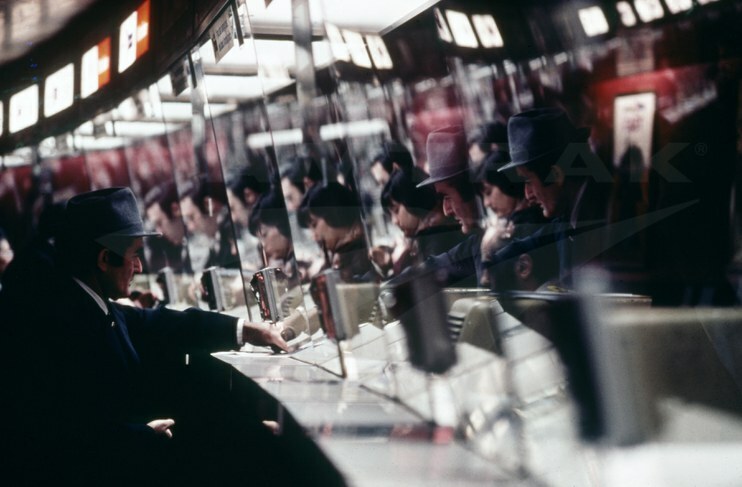 Change is evident when compared to contemporary scenes, but some elements remain the same. Some depots no longer stand, while others have been restored and are now listed as historic landmarks. Below we take a look at a handful of stations then and now. Do you remember any of these stations from Amtrak’s early days? Share your memories in the comments section below. Also, get to know the stations on Tour 1. 1970s: The Kissimmee depot wears a patriotic red, white and blue paint scheme. 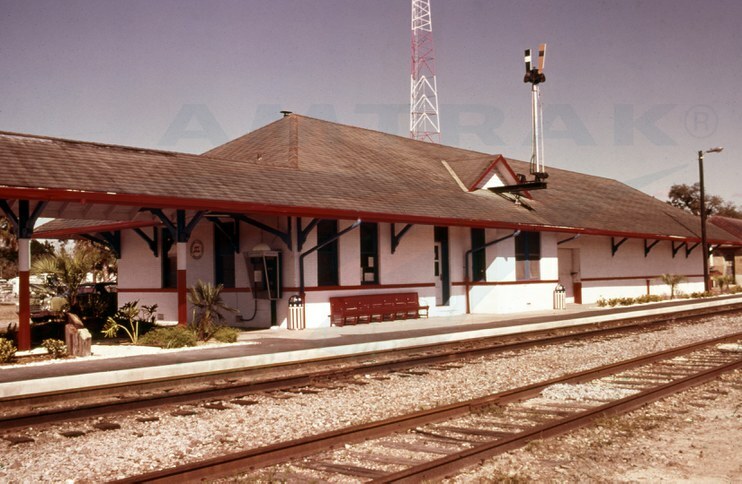 There is no sign in this 1970s image clearly identifying the location of this structure, but comparisons with contemporary photographs such as the one below strongly indicate that it is the historic Kissimmee depot. 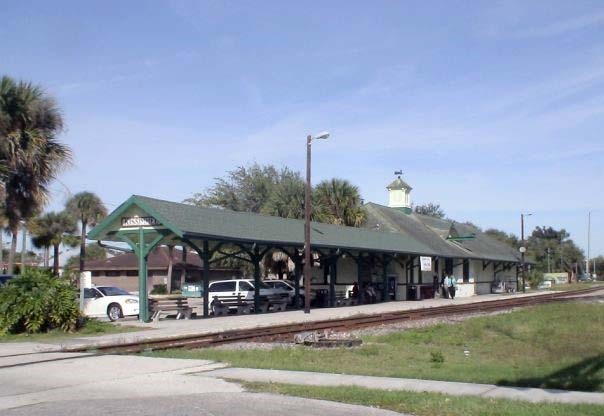 The one story combination depot accommodated passenger and freight uses under one roof and was built in 1910 for the Atlantic Coast Line Railroad. A noticeable change between the old and new images is the elimination of the patriotic red, white and blue paint scheme (especially on the canopy supports) in favor of one that is historically inspired, as well as the reconstruction of the cupola. Building renovations were undertaken in 1976 and again in 1988. As part of the second rehabilitation, which was led by the Kissimmee/Osceola County Chamber of Commerce, more than 120 workers and volunteers graded the parking lot to facilitate drainage, rebuilt the loading dock and decorated it with latticework, cleaned and painted the building, and installed landscaping. 2007: Through multiple renovations, the depot has retained its early 20th century appearance. During the rehabilitation project, workers discovered a pot-bellied stove and an antique casket loader. Much of the construction material was donated, and additional monies were obtained through community fundraising. Today, Kissimmee is a popular stop for those headed to nearby resorts, including Walt Disney World. 1976(? ): A crowd gathers at the Martinsburg depot, likely to welcome the arrival of the inaugural Shenandoah (Washington-Cincinnati). 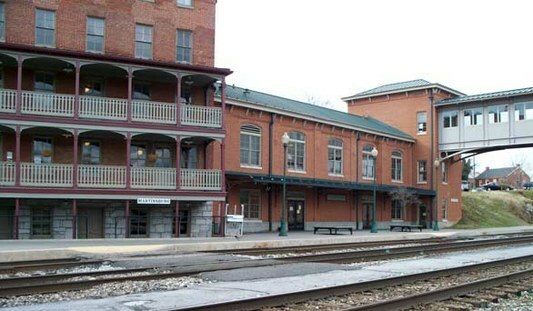 The Martinsburg depot is counted as one of the oldest in the country. The photo above, likely taken in October 1976, shows a combination hotel and depot that was constructed between 1849 and 1866. During the Civil War, troops under Confederate General Stonewall Jackson destroyed the adjacent Baltimore & Ohio Railroad (B&O) roundhouses, shops and rail yards, which were later rebuilt. The town would change hands between Confederate and Union forces nearly 40 times during the war. 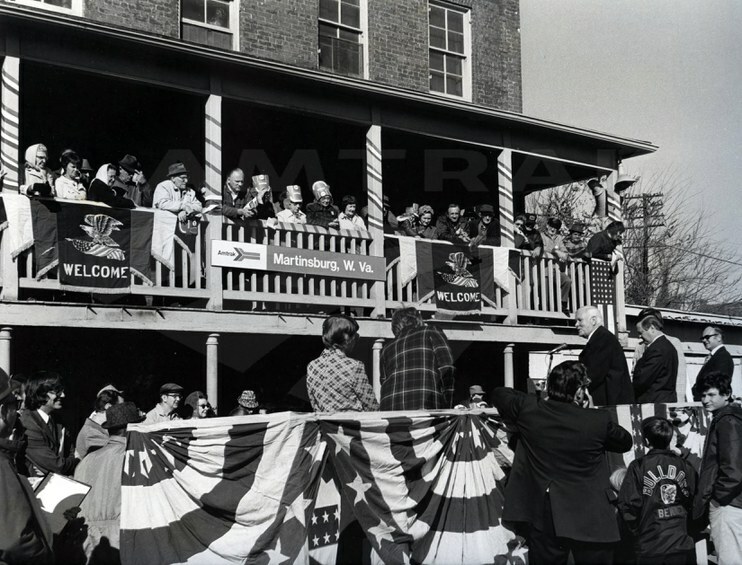 The crowd above was likely gathered to welcome the inaugural run of the Shenandoah (Washington-Cumberland-Cincinnati). The Shenandoah, which ran until 1981, took its name from an earlier train operated by the B&O. Passengers could initially transfer to the combined Mountaineer/James Whitcomb Riley (later the Cardinal) at Cincinnati for connecting service to Chicago. Today, the portion of the route between Washington and Cumberland, Md., is covered by the Capitol Limited (Washington-Chicago). 2007: The Amtrak waiting room is now housed in a 1997 addition. The building in the historic photograph is visible to the left. Amtrak and Maryland Area Regional Commuter (MARC) rail passengers today share space in a 1997 addition to the historic hotel/depot. Designed by the local architectural firm Grove & Dall’Olio, the new red brick transportation center mirrors the Italianate style of its older neighbor. In addition to transportation functions, the station complex houses professional offices, the Washington Heritage Trail National Scenic Byways Welcome Center and Bookshop and the For the Kids, by George Children's Museum. 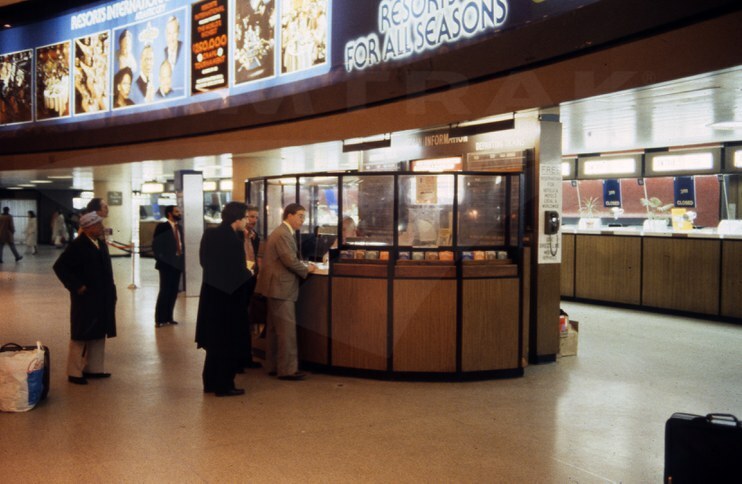 1970s: The ticket counter bustles with activity. Comparing photos old and new, it’s clear that New York Penn Station has long been a busy transportation hub for the nation’s most populous city. 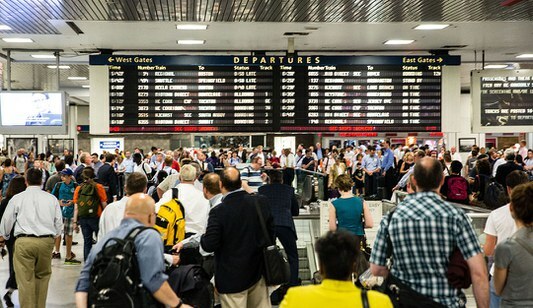 With more than half a million people passing through its concourses every day, Penn Station is the busiest intercity and commuter rail hub in North America. In addition to Amtrak, it serves Long Island Rail Road (LIRR) and New Jersey Transit (NJT) commuter rail, and is readily accessible from 14 lines of the New York City subway. The original Pennsylvania Station, which took the name of its owner and builder, the Pennsylvania Railroad (PRR), opened to the public in the fall of 1910. Considered a masterpiece of Beaux-Arts architecture, it was designed by noted firm McKim, Mead and White. An above ground structure contained the general waiting rooms, while a complex 50 feet below street level accommodated 11 platforms. The station was one piece of a larger $114 million puzzle that included a new right-of-way from Newark, N.J., to Manhattan; bridges; tunnels underneath the Hudson and East rivers; and a new rail yard in Queens. By the mid-20th century, the PRR considered the vast station a financial burden, and it optioned the air rights over the facility. From 1963 to 1966, the station building was demolished to make way for the current Madison Square Garden sports and entertainment arena, as well as the 2 Penn Plaza office building. While the new buildings rose above the underground concourses, the trains continued to run. Amtrak began serving Penn Station when it took over operation of most of the nation’s intercity passenger rail service in May 1971. Twenty years later, all Amtrak trains serving northern and western destinations from Grand Central Terminal were shifted to Penn Station due to the completion of the West Side Connection in Manhattan. 2014: More than 10 million Amtrak passengers began or ended their journey at New York Penn Station in Fiscal Year 2015. In 2010, the first phase of construction began on Moynihan Station, a project to expand Penn Station into the neighboring James A. Farley Post Office building. The project is designed to relieve congestion and improve passenger comfort and security. Moynihan Station is the future home of Amtrak’s operations, offering improved passenger facilities for Northeast Corridor and long distance travel, accessibility for passengers with disabilities, and a grand train hall in the historic Farley building. Phase 1 includes expansion and enhancement of the 33rd Street Connector between Penn Station and the West End Concourse; the extension and widening of the West End Concourse to serve nine of Penn Station’s eleven platforms; new vertical access points and passenger circulation space; new entrances into the West End Concourse through the 31st and 33rd Street corners of the Farley building; and installation of an emergency ventilation system that will improve life safety. The project, scheduled for completion in 2016, is being managed by the Moynihan Station Development Corporation, a subsidiary of the Empire State Development Corporation, a public benefit corporation of the state of New York and the Port Authority of New York New Jersey, in cooperation with Amtrak.